Produced by GLOBE VIDEO FILMS and released November 2001. 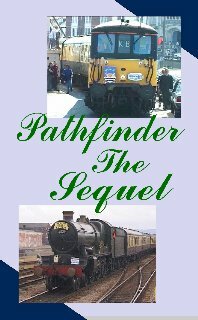 Features diesel, electric & and steam tours operated by Pathfinder Tours from the period 1992-2001. 59 different railtours appear and in many cases several scenes represent each tour. Video carries full detailed captions and includes informative commentary. * 2 or more different scenes of the train at different locations. Reproduction is in stereo and approx running time is 83 minutes.